Let's make an arbitrary list of my favourite games of 2012. 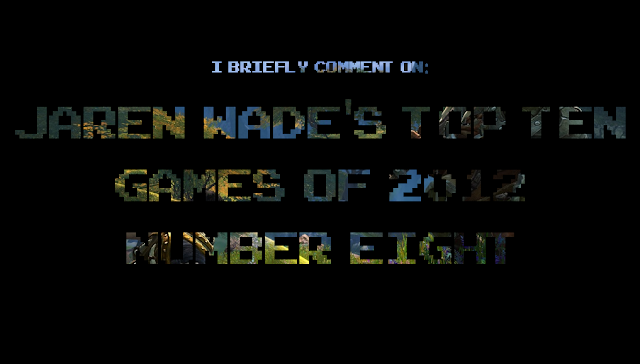 Here's number eight. 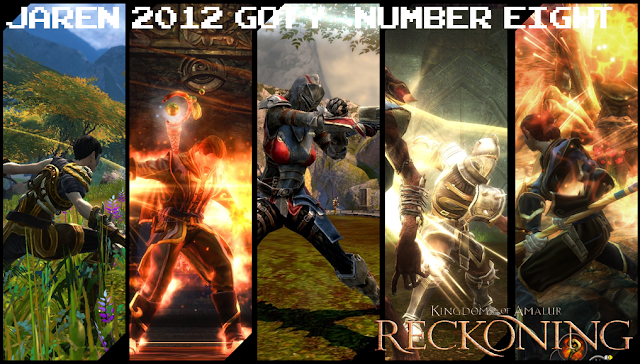 I knew nothing about Kingdoms of Amalur Reckoning until three weeks prior to its release. Even after listening to an entire podcast filled with developers talking about the game, I still was unsure about the world that developers 38 Studios and Big Huge Games were trying to create. It wasn’t until I got my hands on the demo that I started to see what Reckoning had to offer. After an hour worth of playtime, I was ready to purchase the game day one. What instantly grabbed my attention was Reckoning's ability to combine a number of my favourite genres together and still produce a quality package. It’s an action adventure RPG whose battle system utilizes hack and slash combat. While it isn’t the deepest third person fighting system on the market, Amalur offers an impressive variety that allows you to combine magic spells, ranged attacks and melee strikes for some visually stunning combos. Rushing into a group of enemies or the occasional boss encounter was simply fun, and more fast paced than the RPGs I had previously come from. Plus there’s just something satisfying about upper cutting an enemy into the air with your sword, delivering a three hit combo that sends them flying away only to pull them back in with a Scorpion-like spear shot and ultimately finishing them off. Speaking about variety, this game just screams of it. There are a fair number of enemies that populate the world, each with their own weak spots and strategies in regards to fighting them. If that wasn’t enough, Amalur features a loot system, with different weapons, accessories and armor scattered around. You could also craft your own items, a feature I didn’t really partake in. Although your creations could ultimately break the game in your favor, crafted items simply didn’t look as cool as some of the unique items / rewards you would eventually come across. I mean, style over practicality right? One of the goals an RPG strives to attain is telling the player a compelling story. Though the tropes and archetypes are usually the same, how a game presents them usually separates a good effort from a great one. I honestly feel that Amalur resides in the latter, with a story that immediately caught my attention. The world revolves around the concept that everyone has their destiny planned out, and can know their exact fate at any given moment. A war breaks out against a foe who are unaffected by death. When things are looking most grim, your character manages to come back to life and begins to break the fundamentals that this society bases itself upon. It’s really fascinating just how big a role your character plays in this world. Amalur's story is a unique take on the whole “chosen one” main character motif. It certainly helps that the game is well written, and seeing how each of the world’s inhabitants reacts to your character just existing is definitely entertaining. Like many titles these past couple of years, Amalur utilizes moral choices to help keep players on their toes and invest them into the world. I need to mention the fact that Amalur was the first time I really felt a game was presenting me with a grey dilemma. For many games this generation, moral choices revolved around a right/good option and a wrong/evil one. Their consequences were obvious and choosing between the two ultimately boiled down which ingame karma bar you wanted to fill. Amalur didn’t have a morality meter, and your choices reflected how you felt about the characters in the context of this fate-based world. Having to let the game sit there as I pondered a particular choice was refreshing. Well, it would have been if I weren’t stressing over what to actually pick.